The onshore flow has taken over the region’s weather, and we’re now set up for a pair of gray, on-and-off rainy days with muggy air. The clouds should keep highs in the 70s, but conversely nighttime temperatures aren’t falling much below 70 for most of Houston. A weak front arrives early Saturday, and a stronger one later on Sunday or Monday to bring us back into a late-fall, or early-winter like pattern of cooler weather. The name of the game for the next two days will be gray skies with scattered showers. Lows this morning are generally in the low- to mid-60s, and with dewpoints at just about the same level, relative humidity is near 100 percent. Rainfall on Thursday will generally be light, while there is the slight possibility of some thunderstorms on Friday. This is because a fairly strong storm system will be moving across the lower plains, and bringing severe weather, including the potential for damaging winds and a few tornadoes. 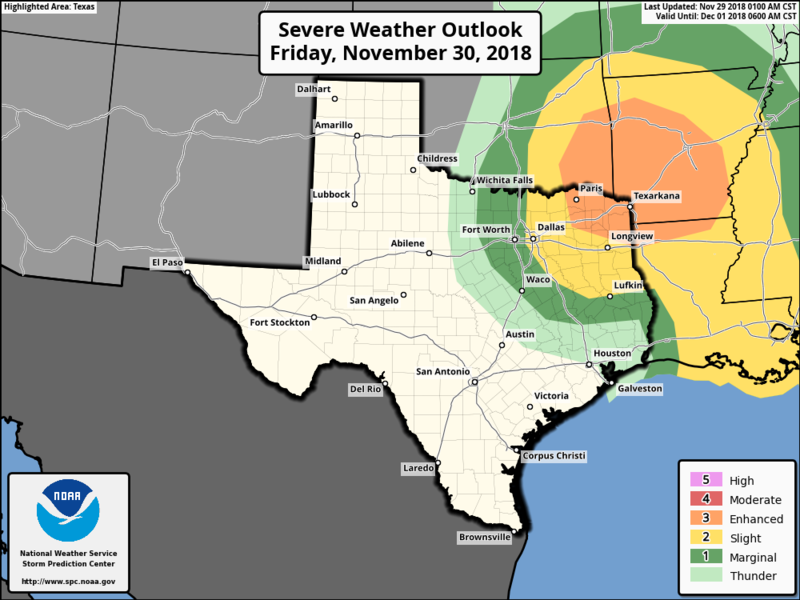 However, the region where the atmosphere is more disturbed should remain north of Houston, running from Lufkin through Texarkana and into surrounding areas shown in the map above. As we’ve been saying for awhile, this should be a great day. After a weak front moves through during the morning hours, we should see a sunny day, with highs in the upper 70s, light winds, and lower humidities. 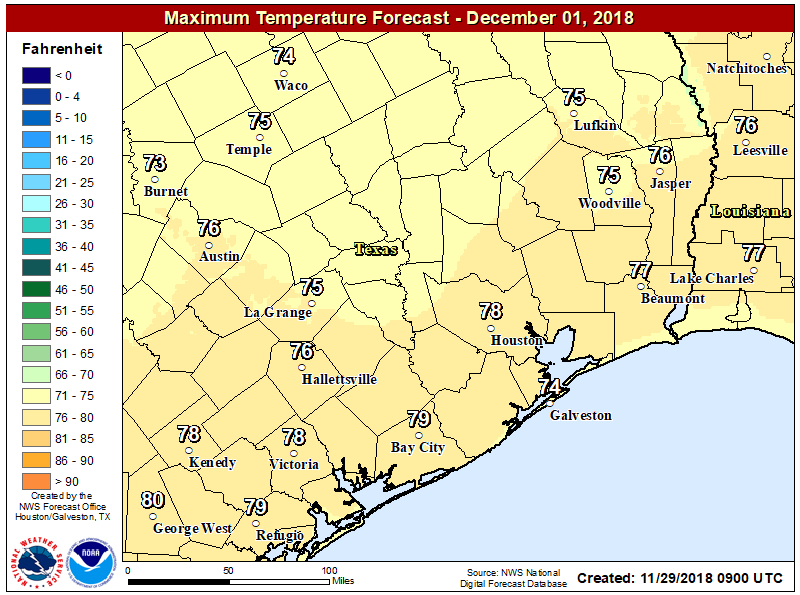 This has the potential to be one of the five nicest weather days in Houston this year, so make your outdoor plans accordingly. This should be another pretty nice day, but winds returning from the south will mean a rise in moisture levels, and we may see some scattered light showers near the coast. Skies should be mostly sunny, with highs again in the upper 70s. A stronger cold front is on track to arrive late Sunday night or Monday morning, and this will bring sunny and colder weather into the region for several days. Temperatures still are uncertain, but it’s likely we see a period of highs in around the 50s, and lows in the upper 30s and 40s through Thursday or so. Rain chances return by Friday or so, and may linger into next weekend, although we’re entering the realm of uncertainty by then. Camping at Lake Houston Wilderness Park; should be great! We’ve had a lot of days in the upper 70s, and I imagine several of these also included low humidity. 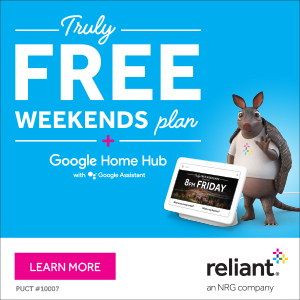 What makes Saturday so special? Dicken on the Strand in Galveston this weekend!